Solar activity follows a regular cycle, with peaks approximately every 11 years. According to NASA, the next solar maximum will occur between 2012-2014 and is predicted to be an average solar cycle, no different than previous cycles throughout history. 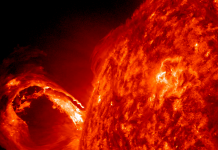 However, solar SUPERSTORMS only occur every 150-200 years and the last one was in 1859. 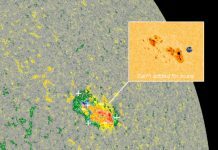 So you don’t need a PhD in Mathematics to calculate that such an extreme solar event will hit the Earth in the near future with consequences for the modern technologies. The next superstorm will indeed result in electricity, satellite, GPS navigation, aviation and mobile phone network (4G, which relies on GPS satellites for timing information) collapses. The next solar superstorm will thus paralyze our society by disrupting our technology!. I really liked this one: Don’t panic, but do prepare!, these gigantic events can only be forecast 30 minutes before they actually happen. Scientists can be so funny sometimes! History. 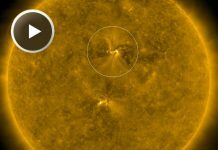 As already indicated, minor solar storms hit the Earth on a regular basis. An example is the Canadian power blackouts back in 1989. The last superstorm occured in 1859 and was named after the British astronomer Richard Carrington. – The Independent.